Back to School means back to Rocketry! Middle and High School Students are encouraged to attend the Sept 6th launch. Now is the time to form Team America Rocketry Challenge Teams. The 2009 TARC Rules are now posted at http://www.rocketcontest.org/pdf/2009_rules.pdf! Get started early — Registration begins on September 3rd! The next SEARS launch is September 6th in Samson, AL. The event is Scale Day. Use a green flight card for any scale model of a space or military rocket and you will entered for a draw from the prize pool. Cliff Oliver plans to fly his Temporary Insanity rocket on an M motor. Cliff certifed L3 on this rocket at the Florida Winter Nationals in February 2008. Justyn Palmer has joined Tripoli/SEARS. He had a successful Level 1 certification flight on July 27th with a rebuilt & modified “Turtleosis” on a Loki H100 Spitfire. He will be testing & attempting his Level 2 cert. flight on 9/6. Good Luck on L2 Justyn! 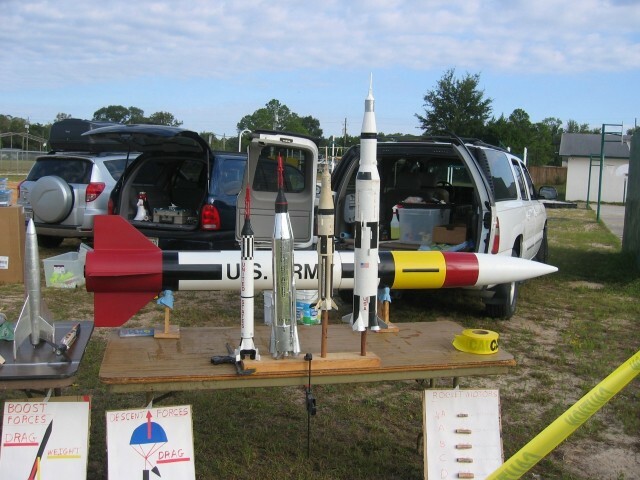 You are currently browsing the SouthEast Alabama Rocketry Society weblog archives for August, 2008.